Size: Length in Kansas up to 75 1/8 inches. Range: Restricted to eastern half of Kansas; in the south ranges as far west as Barber County. Description: Harmless. Keeled scales; generally uniform dark brown or black color on the head, body, and tail. 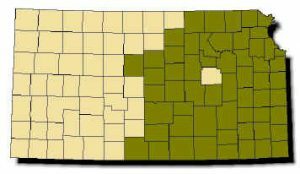 Some adults have an indistinct pattern of dark blotches; those from south-central Kansas may be distinctly blotched. Belly cream or yellow-white, with large indistinct darker areas. 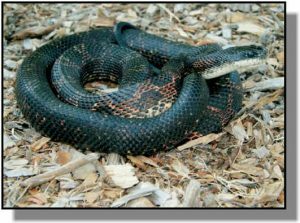 Young are patterned and colored like Great Plains Rat Snakes, but lose this pattern as they grow older. Habits: Inhabits forested areas, particularly the rocky hillsides of open woodlands and wooded areas along streams and rivers. Active from late March to November; becomes more nocturnal during summer. Home ranges of 25–30 acres; frequently seen climbing trees in search of food. Population density about one snake per three acres. Six to 44 eggs per clutch laid in June or July; hatch in 1-2 months. Constrictor. Feeds on frogs, lizards, snakes, bird eggs, birds, rodents, and rabbits. Hawks are main predator.